Villa for sale in Marbella. Do you wish to live in a detached villa in Marbella close to the Mediterranean sea, famous golf courses and the world renowned Aloha College? Then we may just have the perfect villa for you. ‘Charming, warm and stylish’ is the best way to describe this wonderful Andalucian type detached villa in the sought after area of Los Naranjos in Marbella (Nueva Andalucia). It’s located in a very private cul-de-sac on a secluded gated complex – just minutes away from the golf courses of Aloha, Las Brisas and Los Naranjos. It’s intriguing how no less than 5 bedrooms and 3 bathrooms can be found behind the facade. But it is in fact possible. And not only that. There’s a large kitchen with dining area, a big living room with access to a secluded terrace, plenty of storage space, a garage with room for two cars, a beautiful garden with private swimming pool and plenty more to enjoy. This villa breaths a true Andalucian style and offers space, peace and tranquillity with all the facilities and possibilities of cosmopolitan Marbella right at your doorstep. Come see for yourself! The current owner has enjoyed this villa for many years with her family – but as her children now no longer live at home the villa has simply become too big for her. 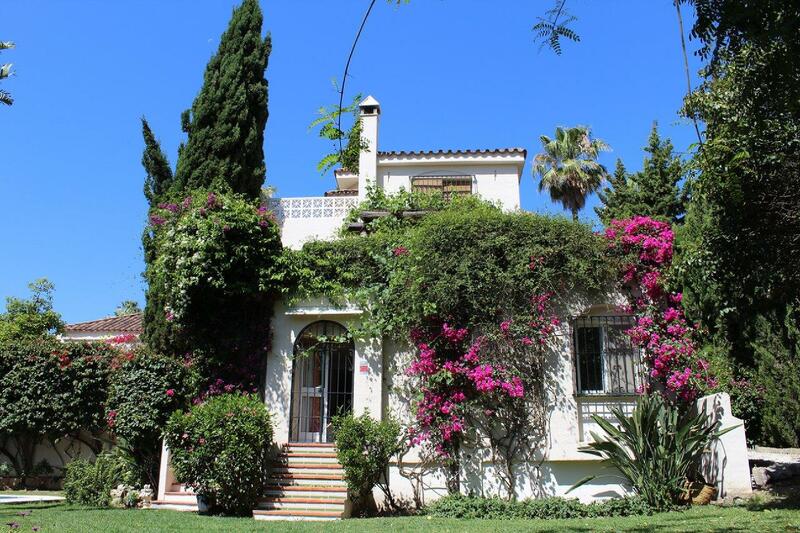 Time to find another villa in Marbella, leaving you a great opportunity to buy this charming Andalusian style house! The villa is located in Nueva Andalucia, more or less in the centre between Los Naranjos, Las Brisas and Aloha Golf (all a 5 minute drive away). This means you have the famous golf courses of Aloha, Las Brisas and Los Naranjos on your doorstep – but also the world renowned Aloha College. Malaga and the airport are about a 45 to 60 minute drive away – and the beaches, shops and restaurants of Marbella and Puerto Banus are just a 10 minute drive. Wish to know more? Click here for photos and more information. You can of course also call or e-mail us. The reference number of this property is MP1081.